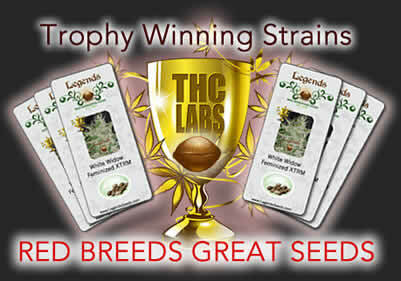 Legends Seeds Canada is Red's Ethical Seed Bank ever since 1999. Buy from the most ethical man in the biz. Red will deliver your order anywhere in the world. There have been many changes with Legends Seeds website. We are now smart phone and tablet friendly. View all your favourite legends strains from your smart phone! Pretty cool for an old hippy like me, technology still amazes me, yet I try my best to avoid it. I prefer sharing a joint with friends than trying to share one through a computer using social networks. I will go out of my way to make sure you get exactly what you order. I personally hand select all seeds to make sure only the premium cream of the crop cannabis seeds reach you. You should expect 100% germination rates and the strain you ordered acclimatized to your local conditions. We have mastered the art of breeding many cannabis strains, and we are forward looking, working on new strains and constantly improving all our classic strains to retain vigerous growth. Legends Ultimate Indica is still world famous, even today, a full two decades later. You won't find a better Indica, even with today's Kush, our LUI (Legends Ultimate Indica) is still the #1 Indica in the world. Over the years I have built a rock solid reputation for always treating our customers well beyond their expectations. I have made thousands of friends just by treating customers honeslty. The harder I work bringing you good deals, the more good karma I get back in return. Contact me anytime, I have been personally answering all emails since 1999, I am fountain of cannabis knowledge and I provide outstanding customer support. We always give our customers 110%, but if you can think of anything we can do to improve our services, please let me know. I would love to go way beyond your expectations. If you have anything you would like to share with our visitors, please let me know by email. I would love to share your garden pics, grow journals and any tips for our web visitors. Medical Marijuana Patients are eager to learn from you as well! Good Karma to you all, Red Owner of Legends Seeds Seed Brokerage Since 1999 Email red@legendsseeds.com P.S. You can buy Legends Seeds in Canada from our only authorized retailer BC Seeds becuase I have moved to Amsterdam. You can also visit the store in Amsterdam for all your cannabis seed needs, shipping is actually faster from Amsterdam to the USA than from Canada.